Luther Stephen "Louis" Griswold was born 1867 in Baraboo Twp., Sauk Co., WI, and died December 11, 1929, in Baraboo, Sauk Co., WI, at about age 62. Buried in Walnut Hill Cemetery (Baraboo Cemetery), Baraboo, Sauk Co., WI. He is the son of Luther Samuel Griswold of Lansdowne, Leeds Co., Upper Canada, and Clarissa H. "Clara" Armstrong of Lansdowne, Leeds Co., Ontario, Canada. Olive Mae Reymour was born February 21, 1865, in the Town of Constantia, Oswego Co., NY, and died January 28, 1949, at 1468 South Float Avenue, Freeport, Stephenson Co., IL, at age 83. Buried in Freeport City Cemetery, Freeport, Stephenson Co., IL. She is the daughter of Benjamin Franklin Reymour of Franklin, Delaware Co., NY, and Betsy Ann "Betty" Hungerford of Berne, Albany Co., NY. Stephen Luther Griswold and Olive Mae Reymour were married November 24, 1886, in Sauk City, Sauk Co., WI. Ruby Clarissa Griswold: Born January 10, 1888, in Baraboo, Sauk Co., WI; Died December 20, 1974, at Leewood Manor Nursing Home, Annandale Twp., Fairfax Co., VA (age 86). Buried in City Cemetery, Freeport, Stephenson Co., IL. Married (1) 1910 in Belvidere, Boone Co., IL, to Fredrick L. "Fred" Shoemaker: Born November 11, 1882, in Hofpa, IL; Died March 2, 1931, in Freeport, Stephenson Co., IL (age 48). Buried March 5, 1931, in City Cemetery, Freeport, Stephenson Co., IL. His parents: Isaac Wade Shoemaker and Nancy "Addie" Amrine. Married (2) December 9, 1936, in Freeport, Stephenson Co., IL, to John George Schmitt: Born January 11, 1890, in Ridott Twp., Stephenson Co., IL; Died October 19, 1966, in Freeport, Stephenson Co., IL (age 76). John was first married about 1911 in Illinois to Myrtle Susan Fisher: Born March 12, 1886, in Rock Grove, IL; Died June 23, 1935, in Ridott Twp., Stephenson Co., IL (age 49). 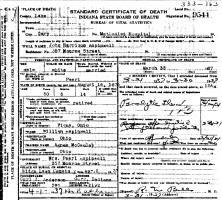 Pearl I. Griswold: Born July 30, 1891, in Baraboo, Sauk Co., WI; Died 11:10 p.m. Sunday, December 25, 1966, at River Bluff Nursing Home, Rockford, Winnebago Co., IL (age 75). Buried in Ridgelawn Cemetery, Gary, Lake Co., IN. 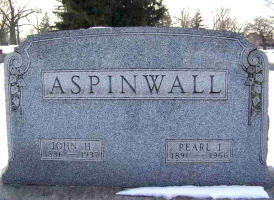 Married November 18, 1920, in Rockford, Winnebago Co., IL, to John Harrison "Jack" Aspinwall: Born August 16, 1885, in Washington, Miami Co., OH; Died March 30, 1937, at Methodist Hospital, Gary, Lake Co., IN (age 51). Buried in Ridgelawn Cemetery, Gary, Lake Co., IN. Luther Stephen "Louis" Griswold and Olive May (Reymour) Griswold were divorced about 1892 in Wisconsin. Luther Stephen "Louis" Griswold then married Amy Unknown. Luther Stephen "Louis" Griswold then married Della Unknown. Della Unknown was born September 6, 1876, in Unknown and died November 11, 1902, in Sauk Co., WI, at age 26 years, 2 months, 5 Days. Luther Stephen "Louis" Griswold and Della Unknown were married about 1900 in Sauk Co., WI. Luther Stephen "Louis" Griswold then married Anna E. Unknown. Anna E. Unknown was born 1881 in Germany, and died 1924 in Greenfield Twp., Sauk Co., WI (about age 43). Buried in Walnut Hill Cemetery, Baraboo, Sauk Co., WI. 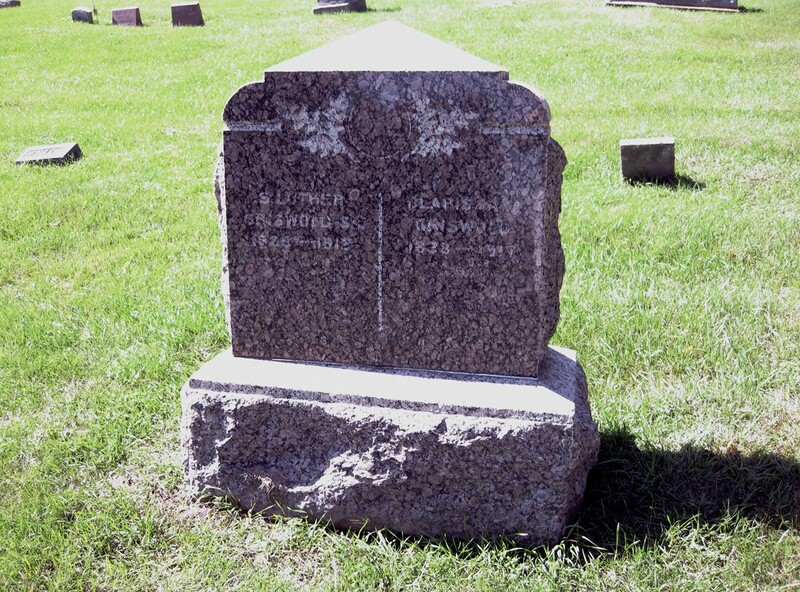 Luther Stephen "Louis" Griswold and Anna E. Unknown were married after 1902 in Sauk Co., WI. Olive Mae (Reymour) Griswold then married Ira Walter Armstrong. Ira Walter Armstrong was born September 26, 1870, in Baraboo, Sauk Co., WI, and died at 4:50 a.m. Sunday, February 13, 1959, in Hines Veterans Hospital, Rockford, Winnebago Co., IL, at age 88. Buried in Freeport City Cemetery, Freeport, Stephenson Co., IL. He is the son of Samuel Bolton Armstrong of Edwardsburgh, Canada West (Ontario), and Delilah Matilda Jones of Tioga, Tioga Co., NY. Ira Walter Armstrong and Olive Mae (Reymour) Griswold were married April 22, 1899, in Madison, Dane Co., WI. Lester A. Armstrong: Born November 2, 1901, in Delton, Sauk Co., WI; Died October 2, 1975, in Parnell Park Nursing Home, Fort Wayne, Allen Co., IN (age 75). Buried in an unmarked grave, Lindenwood Cemetery, Wayne Twp., Allen Co., IN. Married (1) September 19, 1924, in Rockford, Winnebago Co., IL, to Hazel C. Large: Born August 9, 1906, in Decatur, Macon Co., IL; Died September 26, 1968, in Beloit, Rock Co., WI (age 62). Divorced about 1931 in Unknown. Married (2) August 29, 1933, in Wisconsin to Delia Mae (Hirst) Hart: Born December 30, 1908, in Roma Twp., Adams Co., WI; Died April 15, 1982, at a Madison Hospital, Madison, Dane Co., WI (age 73). Ira Walter Armstrong and Olive Mae (Reymour) (Griswold) Armstrong were divorced April 16, 1926, in Rockford, Winnebago Co., IL. John H. Aspinwall and Pearl I. (Griswold) (Waddell) Aspinwall are in buried Ridgelawn Cemetery, Gary, Lake Co., IN. Thanks to Find-A-Grave for making this image available. The 1860 U. S. Census taken on August 28, 1860 shows L. S. Griswold (age 31) born in New York with personal estate of $150 is a Laborer living in Baraboo, Sauk Co., WI. Living with him is Clara Griswold (age 22) born in New York. Also living there are two Griswold children, both born in Wisconsin: Josephine Griswold (age 1); and Ellen Griswold (age 3/12). Also living there are the D. Robbins families. Luther Stephen "Louis" Griswold was born 1867 in Baraboo Twp., Sauk Co., WI. Olive Mae Reymour was born February 21, 1865, in the Town of Constantia, Oswego Co., NY. The 1870 U. S. Census taken on July 20, 1870 shows Luther Griswold (age 41) born in New York with real estate of $3,000 and personal property of $600 is a Farmer living in Baraboo, Sauk Co., WI. Living with him is Clarissa Griswold (age 33) born in New York, who is Keeping House. Also living there are Griswold children, all born in Wisconsin: Josephine Griswold (age 11); Ethlion Griswold (age 10); Laura Griswold (age 8); and Stephen Griswold (age 3). Also living there are: Samuel Armstrong (age 47) born in Canada with father and mother of foreign birth, a Wood Farmer; Cora Armstrong (age 4) born in Wisconsin with father of foreign birth; and Clarissa Armstrong (age 2) born in Wisconsin with father of foreign birth. Also living there is an unrelated home laborer, Mary Houghton (age 18), born in New York. Leigh Larson note: A few houses away live: Dililah Armstrong (age 29) born in New York, who is At Home; and Mary Armstrong (age 7) born in Wisconsin with father of foreign birth. The 1880 U. S. Census taken on June 3, 1880 shows Samuel Armstrong (age 57) born in Canada to New York-born parents who has been disabled for 6 months with liver problems is a Farmer living in Rudolph Twp., Wood Co., WI. Living with him is his wife Lois Armstrong (age 49) born in Michigan to Ohio and New York-born parents, who is Keeping House. Also living there are his step-daughter Floy Wiser (age 12) and step-son Fred Wiser (age 10), both born in Wisconsin to New York and Michigan-born parents. Also at home are his children: Richard Armstrong (age 31) born in New York to New York-born parents, who is a Farmer; Cora Armstrong (age 13), Harry Armstrong (age 11), and Ira Armstrong (age 9), all born in Wisconsin to New York-born parents. The 1880 U. S. Census taken on June 22, 1880 shows Luther Griswold (age 51) born in New York to New York and Unlisted-born parents is a Brick Maker living in Baraboo Twp., Sauk Co., WI. Living with him is his wife, Clarissa Griswold (age 42) born in Canada to Unlisted-born parents, who is Keeping House. Also living there are his unmarried children, all born in Wisconsin to New York and Canadian-born parents: Laura Griswold (age 18); and Stephen Griswold (age 13). Also living there are several Boarders. The 1880 U. S. Census taken on June 22, 1880, shows Benjamin Reymore (age 45) born in New York to New York-born parents Works in Rail Road and is living in the Village of Sharon, Walworth Co., WI. Living with him is his wife, Betsey M. Reymore (age 44) born in New York to New York-born parents, who is Keeping House. Also living there are his three unmarried children, all born in Illinois to New York-born parents: Olive Reymore (age 15); Alexander Reymore (age 8); and John H. Reymore (age 6). Fredrick L. "Fred" Shoemaker was born November 11, 1882, in Hofpa, IL. John Harrison "Jack" Aspinwall was born August 16, 1885, in Washington, Miami Co., OH. Myrtle Susan Fisher was born March 12, 1886, in Rock Grove, IL. 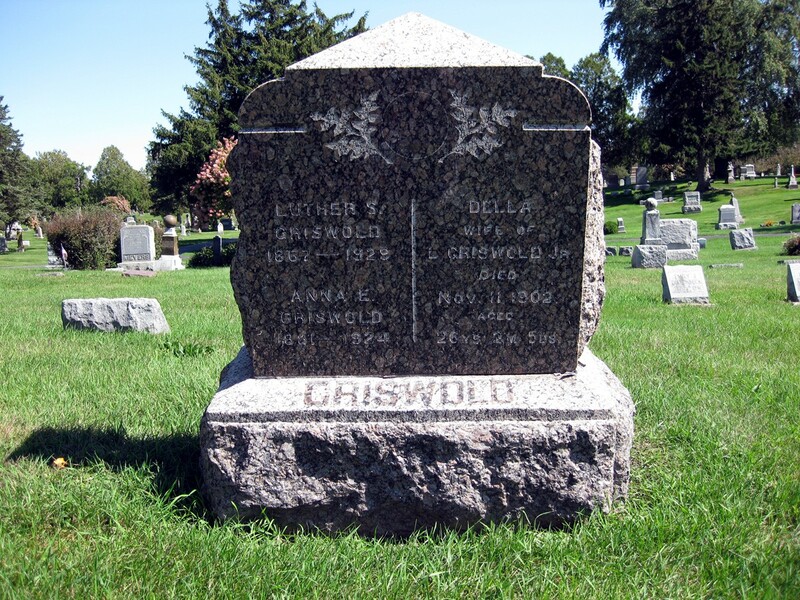 Luther Stephen "Louis" Griswold and Olive May Reymour were married November 24, 1886, in Sauk Co., WI. Ruby Clarissa Griswold was born January 10, 1888, in Baraboo, Sauk Co., WI. John George Schmitt was born January 11, 1890, in Ridott Twp., Stephenson Co., IL. Pearl I. Griswold was born July 30, 1891, in Baraboo, Sauk Co., WI. Luther Stephen "Louis" Griswold and Olive M. (Reymour) Griswold were divorced about 1892 in Wisconsin. The 1895 Wisconsin State Census taken on June 20, 1895 shows S. Luther Griswold is the Head of Household and is living in Baraboo Twp., Sauk Co., WI. Living there: 1 Male and 1 Female, both born in the United States. The 1895 Wisconsin State Census taken on June 20, 1895, shows L. Griswold is the Head of Household and is living in the 3rd Ward, City of Baraboo, Baraboo Twp., Sauk Co., WI. Living there: I Male and 3 Females, 3 were born in the United States. David Chamberlain, residing in the eastern part of this town was arrested last Thursday for assaulting Ira Armstrong, and was tried before justice of the peace Ramsdell. It seems that Mr. Chamberlain succeeded in proving he was justified in the assault and the jury, after being out eleven minutes, brought in a verdict of not guilty. It is rumored around here that the cause is not yet ended. Ira Walter Armstrong and Olive M. (Reymour) Griswold were married April 22, 1899, in Dane Co., WI. Ira Armstrong moved his family to Kilborn today. The 1900 U. S. Census taken on June 15, 1900 shows Ira W. Armstrong (age 29) born September 1870 in Wisconsin to New York-born parents is a Day Laborer owning his own home and living in Delton Twp., Sauk Co., WI. Living with him is his wife of 1 year, Olive M. Armstrong (age 33) born February 1867 in New York to New York-born parents, with both of the children born to her still alive. Ira's step-children living at home, born in Wisconsin to Wisconsin and New York-born parents: Ruby C. Griswold (age 12) born January 1888; and Pearl I. Griswold (age 8) born July 1891. 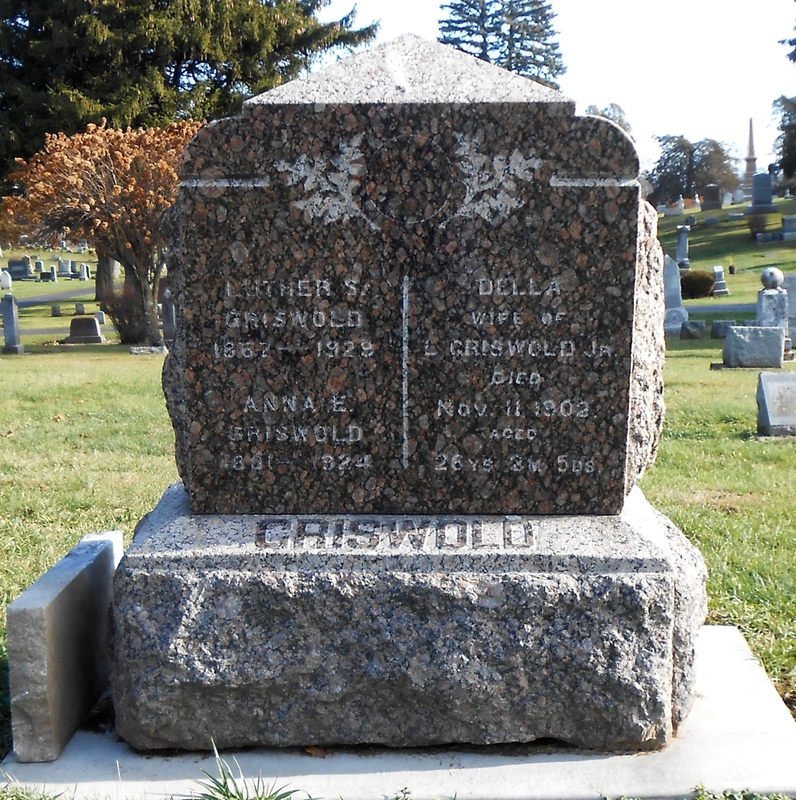 Della (Unknown) Griswold died November 11, 1902, in Sauk Co., WI, at age 26 years, 2 months, 5 Days. The 1910 U. S. Census taken on April 20, 1910, shows Lewis Griswold (age 40) born in Wisconsin to New York and English Canadian-born parents and in his third marriage is a Liveryman with his Own Barn, and is living in the Village of Ableman, Sauk Co., WI. 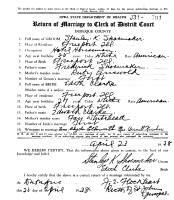 Fredrick L. "Fred" Shoemaker and Ruby Clarissa Griswold were married (1) 1910 in Belvidere, Boone Co., IL. John George Schmitt and Myrtle Susan Fisher were married about 1911 in Illinois. Ira Walter Armstrong and Olive Mae (Reymour) (Griswold) Armstrong had their two lots foreclosed upon in November, 1912, in the Town of Belvidere, Boone Co., IL. The 1920 U. S. Census taken on January 24, 1920 shows Irey Armstrong (age 50) born in Wisconsin to New York-born parents is a General Carpenter rents his home and is living at 1423 North Court Street, 4th Ward, City of Rockford, Winnebago Co., IL. Living with him is his wife, Olive Armstrong (age 50) born in Wisconsin to Canadian and New York-born parents. Living at home are: Ira's unmarried step-daughter, Pearl Griswold (age 27) born in Wisconsin to Wisconsin and New York-born parents; and son, Lester Armstrong (age 18) born in Wisconsin to Wisconsin and New York-born parents, a Pool Hall Racker. The 1920 U. S. Census taken on January 3, 1920 shows Louis S. Griswold (age 51) born in Illinois to New York-born parents is a General Farm Farmer who owns his own farm with a mortgage and is living in Greenfield Twp., Sauk Co., WI. Living with him is his wife, Anna E. Griswold (age 37) born in Germany to German-born parents and a Naturalized Citizen. The 1920 U. S. Census taken on January 12, 1920, shows Fred Shoemaker (age 36) born in Wisconsin to Indiana and Illinois-born parents is a Laborer at a Gas Plant who is renting his home and is living at 3 Center Street, 5th Ward, City of Freeport, Freeport Twp., Stephenson Co., IL. Living with him is his wife, Ruby Shoemaker (age 31) born in Wisconsin to New York and Wisconsin-born parents. Also living there are his four sons, all born in Illinois to Illinois and Wisconsin-born parents: Donald Shoemaker (age 8); Stanley Shoemaker (age 6); Arnold Shoemaker (age 3-6/12); and Luther Shoemaker (age 4/12). The 1920 U. S. Census taken on January 14, 1920, shows Alexander Davidson (age 49) Born in Pennsylvania to Scottish-born parents, is a married Machinist at a Steel Mill who is renting his home, and is living at 440 Jefferson, 7th Ward, City of Gary, Calumet Twp., Lake Co., IN. Living with him are: his wife, Lerette Davidson (age 38) born in Ohio to Ohio and Canadian-born parents; an unmarried Roomer, Harry Dowall (age 42) born in Ireland to Irish-born parents, and having immigrated in 1910, and with Al Citizenship, a Superintendent in Steel Mills; and an unmarried Roomer, John Aspinwall (age 30) born in Ohio to Ohio-born parents, a Laborer in Steel Mills. John Harrison "Jack" Aspinwall and Pearl I. Griswold were married November 18, 1920, at Trinity Lutheran Parsonage, Rockford, Winnebago Co., IL. The marriage of Miss Pearl Griswold of this city to Mr. John H. Aspinwall of Gary, Ind., will take place this afternoon at Trinity Lutheran parsonage, the Rev. H. M. Bannen officiating. The bride will wear her going away suit of dark brown with seal trimmings and hat to match, and corsage bouquet. The couple will be unattended. Immediately after the ceremony Mr. Aspinwall and his bride will leave for Chicago and will go to Gary to reside where the groom is engaged in business. Miss Griswold is the daughter of Mrs. Olive M. Armstrong of Winnebago, and has made her home in Rockford a number of years. She has been engaged in the Gibson Laundry company office and had entire charge of the office while Mr. Gibson was in the army service. Mr. Aspinwall is the son of Mrs. Agnes Aspinwall of Piqua, Ohio, and was in the 86th division during the World war. Previous to his enlistment he was with the Baker-Rauch and Lang Automobile company of Cleveland, Ohio. Ira Walter Armstrong lived in Rockford, Winnebago Co., IL, in 1921. Ira Walter Armstrong deserted his wife, Olive Mae (Reymore) (Griswold) Armstrong, on August 28, 1923. Anna E. (Unknown) Griswold died 1924 in Wisconsin, at about age 43. Buried in Walnut Hill Cemetery, Baraboo, Sauk Co., WI. Attys. Large & Reno have filed a suit for divorce for Mrs. Olive M. Armstrong against Ira W. Armstrong on the ground of desertion. The couple were married April 22, 1898 at Madison, Wis. It is alleged that Armstrong deserted his wife Aug. 28, 1923. Judge Shurtleff this morning granted divorces to Mrs. Olive M. Armstrong from Ira. W. Armstrong and to Mrs. Goldie Arbs from Leo Arbs. Both divorces were granted on the charge of desertion. The two suits were not contested. Mrs. Olive Armstrong sold her residence in Winnebago, Winnebago co., IL, about February 2, 1927, and moved to Freeport, IL, to reside. The 1930 U. S. Census taken on April 21, 1930, shows Ira W. Armstrong (age 62) born in Wisconsin to New York-born parents, and first married at age 32, is a Laborer at the City Dump Yard, and who rents his home for $20/month, and is living at 249 Maple Avenue, 7th Ward, City of Beloit, Rock Co., WI. Living with him is his wife, Olive Armstrong (age 65) born in New York to New York-born parents, and first married at age 21. The 1930 U. S. Census taken on April 2, 1930, shows Lester Armstrong (age 28) born in Wisconsin to Wisconsin-born parents and first married at age 22 is a Trucker of Any Kind Of Trucking owning his home worth $700 and is living on Fifth Street, Beloit Twp., Rock Co., WI. Living with him is his wife, Hazel Armstrong (age 22) born in Illinois to Wisconsin-born parents and first married at age 18. Fredrick L. "Fred" Shoemaker died March 2, 1931, in Freeport, Stephenson Co., IL, at age 48. Buried March 5, 1931, in City Cemetery, Freeport, Stephenson Co., IL. Myrtle Susan (Fisher) Schmitt died June 23, 1935, in Ridott Twp., Stephenson Co., IL, at age 49. Beloit, Wis., Oct. 25. - Ira Armstrong, 69, 1877-1/2 5th street, suffered minor cuts about the face when the automobile in which he was riding collided with another machine owned by Clifford Royce, rural route 1, Clinton, in front of 1817 5th street early this evening. Lester Armstrong, Henry avenue and Riverside drive, driver of the machine, was uninjured. The injured man was taken to Municipal hospital be Elmer Wilson, 1817 5th street. Armstrong was driving north on 5th street when the accident occurred, according to a police report. Both machines were damaged considerably. John George Schmitt and Ruby Clarissa (Griswold) Shoemaker were married December 9, 1936, in Freeport, Stephenson Co., IL. John Harrison "Jack" Aspinwall died March 30, 1937, at Methodist Hospital, Gary, Lake Co., IN, at age 51. Buried in Ridgelawn Cemetery, Gary, Lake Co., IN. 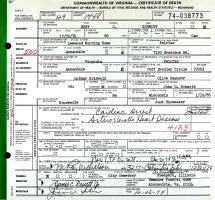 John Harrison "Jack" Aspinwall Death Record. Pearl I. (Griswold) Aspinwall moved back to Rockford, Winnebago Co., IL, in 1938. Stanley K. Shoemaker and Edith Clarke were married April 23, 1938, Dubuque, Dubuque Co., IA. 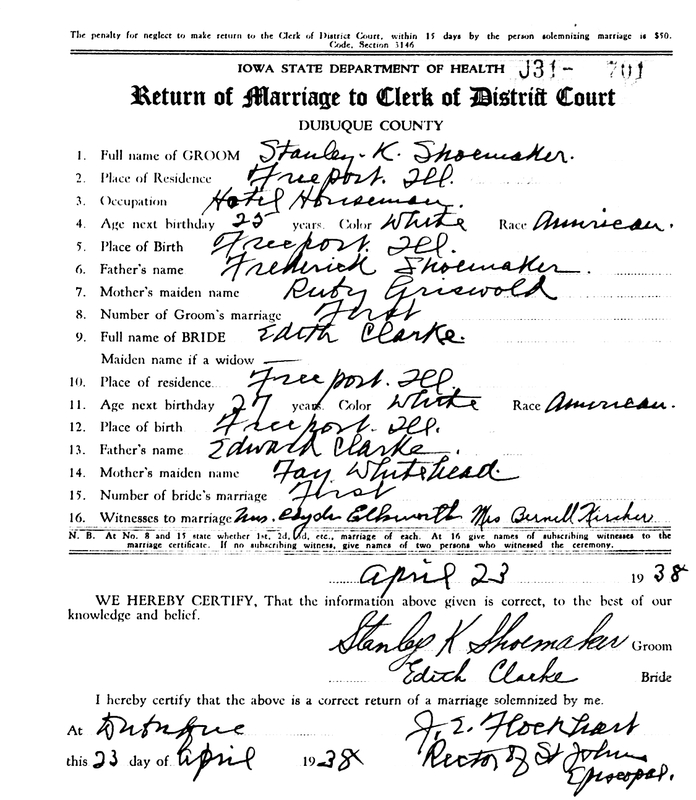 Stanley K. Shoemaker and Edith Clarke Marriage Record. Mr. and Mrs. Edward Clarke, 524 South Adams Avenue, announce the wedding of their daughter, Edith, to Stanley K. Shoemaker, son of Mrs. John Schmitt which took place Saturday, at high noon, at Dubuque. Rev. J. T. Flockhart, rector of St. John's Episcopal church, officiated at the ceremony. The groom is employed at Hotel Freeport and he and his bride have gone to housekeeping at 443 South Adams avenue. 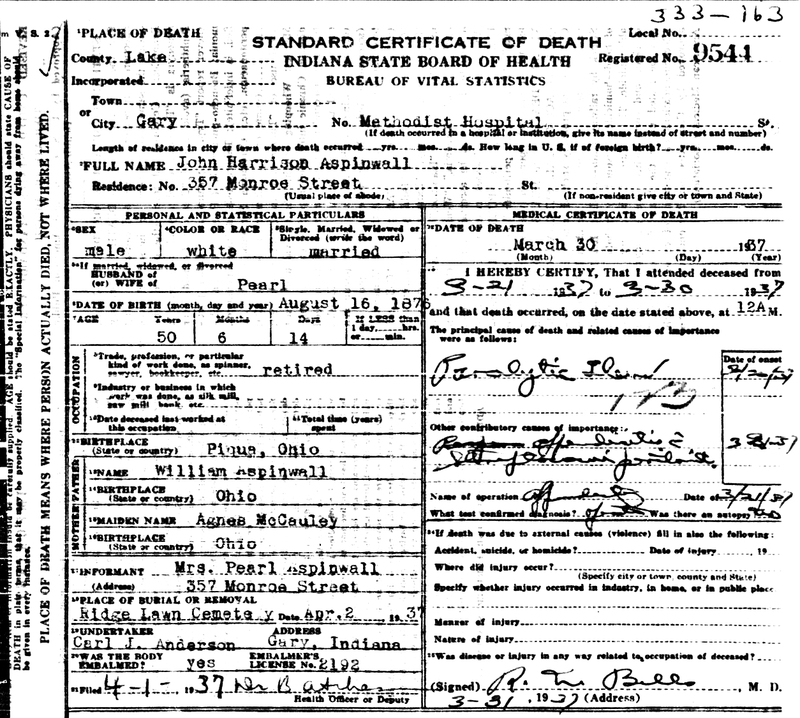 The 1940 U. S. Census taken on April 20, 1940, shows Pearl Aspinwall (age 48) born in Wisconsin, and 5 years ago was living in Gary, Lake Co., IN, and with 4 years of High School, is a widow who is renting her home for $53/month, and is living at 309 Whitman Street, 4th Ward, City of Rockford, Winnebago Co., IL. Living with her are two lodgers. Fred D. Shoemaker, Died 1948 - 1974; married Bertha A. Unknown; daughter Shirley Shoemaker. Stanley K. Shoemaker: Born August 9, 1913, in Freeport, Stephenson Co., IL; Died February 1982 in Freeport, Stephenson Co., IL (age 68), married Edith B. Clarke: Born November 15, 1911, in Illinois; Died May 1973 in Illinois (age 61). Arnold W. Shoemaker: Born July 5, 1916, in Freeport, Stephenson Co., IL; Died December 1962 in Illinois (age 46), Married June E. Unknown: Born June 12, 1919, in Unknown; Died March 28, 1991, in Illinois (age 71). Luther F. Shoemaker: Born August 16, 1919, in Freeport, Stephenson Co., IL; Died October 23, 1970, in Los Angeles Co., CA (age 51). Married Unknown to Virginia L. Unknown. Mr. and Mrs. Ira Armstrong and grandson, Walter have moved to Brodhead. Mr. and Mrs. Ira Armstrong, Beloit, have moved into the Laube Searles house. Mr. and Mrs. Lester Armstrong and daughter, Beloit; Mr. and Mrs. John Schmidt, Freeport; and Mrs. Pearl Aspinwal, Rockford, were Sunday guests of their parents, Mr. and Mrs. Ira Armstrong. Mrs. Ira Armstrong spent Monday with her grandson Walter Armstrong, Footville. Mr. and Mrs. Ira Armstrong spent Tuesday with their grandson Walter Armstrong, Footville. Mr. and Mrs. John Schmid, Freeport; were Juda callers Wednesday. Her parents, Mr. and Mrs. Ira Armstrong accompanied them home for a few days visit. Olive Mae (Reymour) (Griswold) Armstrong died January 28, 1949, at 1468 South Float Avenue, Freeport, Stephenson Co., IL, at age 83. Buried in Freeport City Cemetery, Freeport, Stephenson Co., IL. Mrs. Olive Mae Armstrong, 83, died last night at the home of her daughter, Mrs. John Schmitt, 1468 South Float avenue. She was a resident of Juda, Wis., and had been at the home of her daughter for the past week. Services will be held at the Eichmeier and Becker funeral home, West Stephenson street, at 1:30 p. m. Monday. Interment will be made in City cemetery. The daughter of Mr. and Mrs. Benjamin Reymour, she was born in New York Feb. 21, 1865. She was married to Ira Armstrong in 1898. Besides her husband she leaves the following children, Lester A., Beloit; Mrs. John Aspinwall, Rockford, and Mrs. Schmitt. A sister and a brother also survive, Mrs. Minnie Nash, Detroit, Mich, Al Remour, Roscoe, Ill. There are six grandchildren and five great-grandchildren. Ira Walter Armstrong died at 4:50 a.m. Sunday, February 13, 1959, at Hines Veterans Hospital, Rockford, Winnebago Co., IL, at age 88. Buried in Freeport City Cemetery, Freeport, Stephenson Co., IL. Ira. W. Armstrong, a former resident of Freeport, died in Hines Veterans Hospital early Sunday after a short illness. He was 92 years of age and farmed in the Freeport area. He was the son of Mr. and Mrs. Samuel Armstrong. For the past several years he made his home at Rockford with a stepdaughter, Mrs. Pearl Aspinwall. Survivors include a son, Lester of Rockford; a brother, Harry of Ladysmith, Wis.; two stepdaughters, Mrs. Aspinwall and Mrs. John Schmitt of Freeport, and six grandchildren. Service will be in Burke-Tubbs Funeral Home at 1:30 p.m. Wednesday with the Rev. George Busekros, pastor of Bethany United Church of Christ, officiating. Interment will be in City Cemetery. Ira. W. Armstrong, 92, 1143 N. Church st., died at 4:50 a.m. Sunday in Hines Veterans hospital, where he was taken Thursday from Rockford Memorial hospital, where he had been for two weeks. Mr. Armstrong was born Sept. 26, 1866, in Oswego, Wis., the son of Samuel B. and Delilah Armstrong. He was married to Ms. Olive Mae Griswold in Madison in 1898. He came to Rockford when his wife died in February, 1949. Survivors include a son, Lester A., Rockford; two stepdaughters, Mrs. Ruby Schmitt, Freeport, and Mrs. Pearl Aspinwall, Rockford, with whom he lived; a brother, Harry Ladysmith, Wis.; six grandchildren; nine great-grandchildren; and several nieces and nephews. Services will be held at 1:30 p.m. Wednesday in Burke-Tubbs funeral home, Freeport. Burial will be in City cemetery there. John George Schmitt died October 19, 1966, in Freeport, Stephenson Co., IL, at age 76. Pearl I. (Griswold) Aspinwall died December 25, 1966, at River Bluff Nursing Home, Rockford, Winnebago Co., IL, at age 75. ASPENWALL - Pearl T. Aspenwall, 75, formerly of 321 Adams St., died 11:10 p.m. Sunday, Dec. 25, 1966, in River Bluff Nursing Home after long illness. Born July 30, 1891, in Baraboo., Wis., daughter f Mr. and Mrs. Leu Griswold. Married to John Aspenwall in Rockford in 1920. He died in 1937. Employed as a secretary. Survivors include: one sister, Mrs. Ruby Schmitt, Freeport, and one half-brother, Lester Armstrong, Beloit, Wis. Services at 8 p.m. Thursday in the SUNDBERG FUNERAL HOME, 215 N. 6th St. with the Rev. Carl Linder, assistant pastor of Zion Lutheran Church officiating. Burial in Ridgelawn Cemetery, Gary, Ind. Friends may call from 7 p.m. to 8 pm. Thursday in the funeral home. Ruby Clarissa (Griswold) (Shoemaker) Schmitt died December 20, 1974, at Leewood Manor Nursing Home, Annandale, Fairfax Co., VA, at age 86. Buried in City Cemetery, Freeport, Stephenson Co., IL. 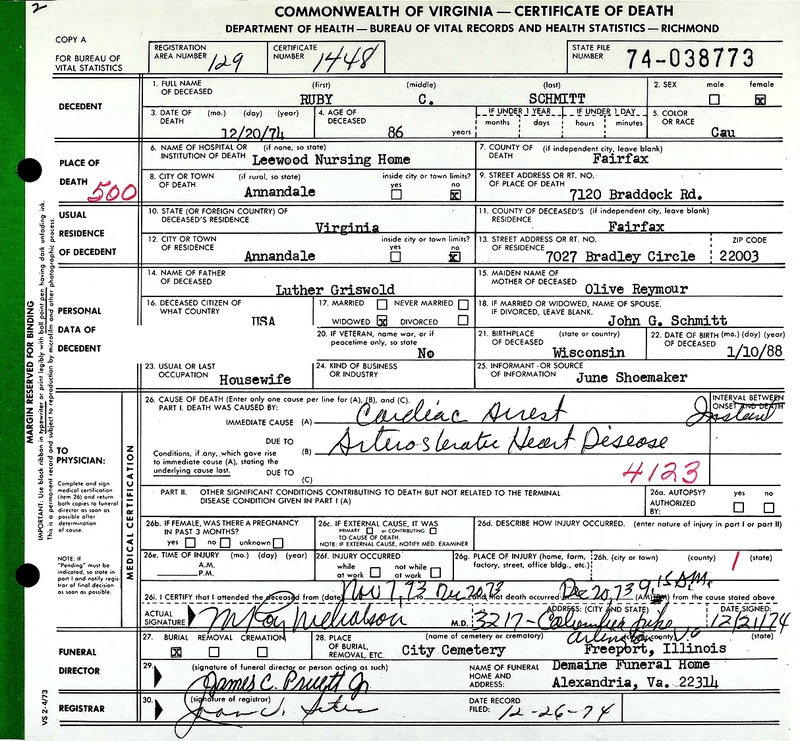 Ruby Clarissa (Griswold) (Shoemaker) Schmitt Death Record. Mrs. Ruby Schmitt of Annadalen, Va., formerly of Freeport, died this morning at the Leewood Manor Nursing Home there. Funeral arrangements are pending. Funeral service for Mrs. John G. (Ruby) Schmitt of Annadelen, Va., who died Friday morning, will be at 1:30 p.m. Monday at Burke-Tubbs Funeral Home. She was a former Freeport resident. The Rev. Clarence Langdon of Grace Episcopal Church will officiate. Burial will be in City Cemetery. Friends may call at the funeral home from 3 to 5 p.m. Sunday. A memorial has been established. Mrs. Schmitt was born Jan. 10, 1888, in Baraboo, Wis., a daughter of Luther and Oliver Mae (Reumour) Griswold. In 1908 she married Frederick Shoemaker in Belvidere. He died in 1931. She married John Schmitt on Dec. 9, 1936, in Freeport. He died Oct. 19, 1966. Surviving are a son, Stanley Shoemaker of Freeport, and a stepson, Russell Schmitt of Pecatonica. She was preceded in death by a sister. Lester Armstrong died October 2, 1975, in Parnell Park Nursing Home, Fort Wayne, Allen Co., IN, at age 75. Services for Lester Armstrong, 73 formerly of 2110 Cheyanne Drive will be at 2 p.m. today in D. O. McComb & Sons Lakeside Park Funeral Home. He died at 5:10 p.m. yesterday in Parnell Park Nursing Home. Mr. Armstrong, a native of Wisconsin, was a retired construction worker. Surviving are his wife Delia; and a daughter Mrs. Olive Keating of Rockland, Maine. Burial will be in Lindenwood Cemetery. Olive May (Armstrong) Keating died October 6, 2001, in Owls Head, Knox Co., ME, at age 65.